As many of you know, Reynolda Village is a short and delightful walk from campus. From the parking lot that is down the hill from the Porter Byrum Welcome Center and before you get up to Winston Hall (bio building), there is a wonderful path that connects campus to Reynolda Village. Longtime Daily Deac readers will know that I am very fond of food, and I developed a raging case of Francophilia during my time as an exchange student in France. 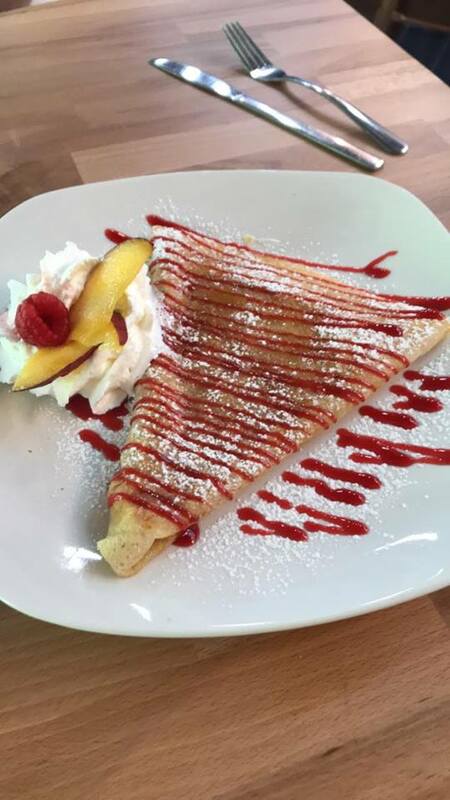 Well, my two obsessions have just collided in the most delightful way: Penny Path Cafe and Crepe Shop just opened in Reynolda Village. Y’all, I really really really hope that hope that Penny Path can make a go of it, because this would be a great place for you to check out at Move-In weekend or Family Weekend. And certainly would be a great treat for your students. I have only eaten there once (they just opened), but I can speak to the quality of the food, and it is delicious. They offer both sweet and savory crepes, and Mr. Daily Deac and I tried one of each to split. We had a Crepe Suzette (an orangey liqueur flavor) and also an Herb de Provence with fresh tomato and spinach, cheese, herbs, and garlic butter spread. They were really and truly fantastic. They had all the flavors you’d expect – strawberry, banana, nutella among the sweets, and plenty of cheese and meat options, pesto, etc. on the savory side. If I recall correctly, no crepes were over $10. Because it is in Reynolda Village, it is not an enormous space – probably seating inside for no more than 30, but they did have tables outside. Delightful ambiance and true to its name, the floor has a path made of pennies. Really charming. Much as I wish I did, I am not getting paid to endorse them – I just like to see good food options in town. And since this one is in walking distance for our Deacs, it’s one they ought to know about. So for those with Deacs in summer school, pass it along!